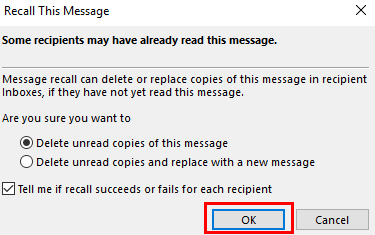 In Outlook, if you are using Microsoft Exchange and you need to recall an email message, you can do so by going to advanced message options within the desktop client. This allows you to rescind messages or update messages you have already sent without needing to send out any additional messages. Note: This will only work if both you and the message recipient are using Microsoft Exchange. If one email is not using Exchange, the message cannot be recalled. 2. 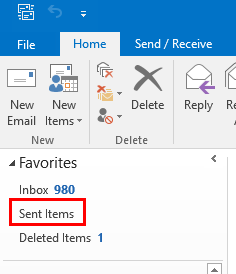 Navigate to the Sent Items folder in the left sidebar. 3. Double click the message you want to recall. 4. A new window will appear showing only the message you clicked, as well as a bar at the top with several options and menus. 5. Click the Message menu at the top left area of the window. 6. Navigate to the Move section of the dropdown ribbon and select the More Move Actions icon at the right. 7. Select Recall This Message... from the dropdown menu. 8. Select whether or not you want to only Delete unread copies or to Delete unread copies and replace with a new one. You can optionally select whether or not you want to be notified if the recall succeeds or fails. When finished, click OK at the bottom of the window. 9. If you selected Delete unread copies and replace with a new one, a new message box will pop up where you may write the message you want to replace the old one with. When finished, click Send at the left side of the window.